When it comes to choosing the correct front door for your property there are a lot of things to consider. Do you want timber or aluminium frames, or should you really trust uPVC doors? uPVC doors are known to have extremely good insulation properties when compared to it’s metals and wooden rivals. The quality finish with uPVC doors ensure a higher level of comfort all year round. Unlike wooden framed doors, uPVC doors are very difficult to ignite and therefore improve the standard of fire safety in your property. with uPVC doors there is very little condensation that forms when comparing to aluminium framed doors. Keeping the all important damp out of your property. 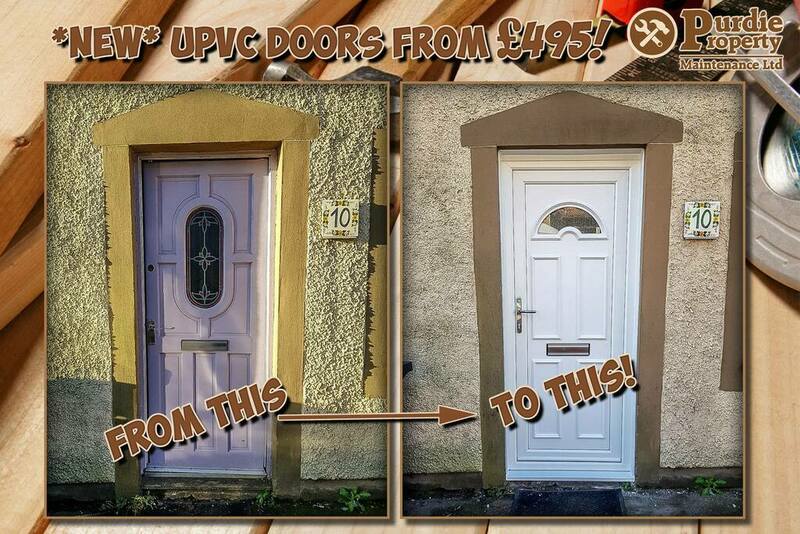 uPVC is now the cheaper option when compared to wood and metal doors. uPVC is also alot more durable in cold weather compared to wooden frames that can wrap and rot. There is also alot more style options to choose from with uPVC doors as they can be produced in varying colours and designs. Compared to wooden and metal doors frames uPVC products don’t need nearly as much maintenance and as a result generally last a lot longer. Lastly, if you manage to upgrade all your doors and windows in your home to uPVC you’ve just increased the resale value of your home too! To get a quote for a new uPVC door or windows, drop us a message or call us today! Founded in 2018, Purdie Property Maintenance forms part of the Purdie Worldwide group. Focusing on Home Improvements Purdie Property Maintenance aim to produce next level home improvments for the Smart Generation.